Sterling Silver Adirondack II "Batwing"
This lost-wax-cast Adirondack II "Batwing" belt buckle is a modification of our popular 2006 annual edition. The engraved top and bottom plates, as well as the decorative, engraved back plate were re-worked with new designs. The belt buckle has a 1" (25mm) wide opening and is assembled from 5 pieces of silver and gold. The two raised 14K gold scroll-work sections on the front are attached to the silver buckle with tiny jewelry screws, as is the engraved silver backplate. The 14K gold oval is sandwiched between the body of the buckle and the backplate. 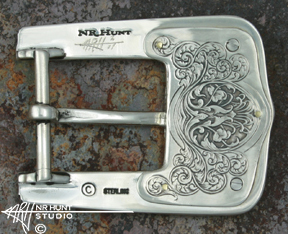 All the parts to the buckle are cast in solid sterling silver and 14K gold from Neil's original hand engraved masters. It is hand finished and hand signed by the artisan. 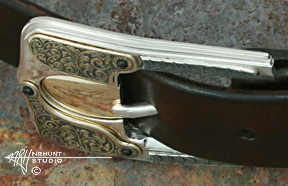 This is truly a unique buckle, very reminiscent of a classic, engraved shotgun. The Adirondack II "Batwing" belt buckle is available in Solid Sterling Silver with a 14K Gold center oval and top and bottom plates. Overall measurements are 1 15/16" high, and 2 1/2" long.